for you all – who know or do not know our service of shared bikes – we have some practical advice. 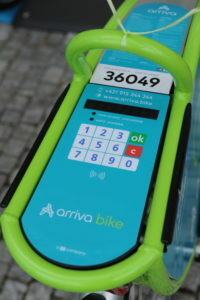 If you are interested in using the bike-sharing service arriva bike, you need to sign up and have an arriva bike account. How does the smartphone registration look like? 1. Download the App arriva bike to your smartphone and sign up. 2. Accept general terms and conditions. 3. Enter your phone number and Email address. 4. Add Name and Surname. 5. You will receive your 6-digit PIN by SMS, which you enter to the App. 6. To activate your account you need to provide payment card details. If you could not sign up successfully, please call our customer service at +421 915 244 244. 1. Open the App arriva bike. 2. Enter to the app bike number, 5 digits code f.e. 36017. 3. Receive the Bike Code (4 Digits) via App. 4. Open the bike by using the Code on the bike computer and press “OK”. 5. The lock of the bike opens automatically. How to correctly return the arriva bike? Bikesharing – new adventure in Nitra. Would you like to try?